Our range of products include centrifugal pump test rig, gear pump test rig, hydraulic ram test rig, reciprocating pump test rig, submersible pump test rig and kaplan turbine test rig. 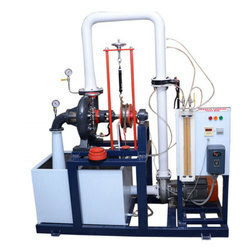 We are offering a wide range of Centrifugal Pump Test Rig. 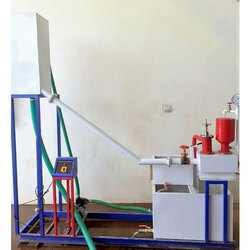 The present Centrifugal Pump Test Rig is a self-contained unit operated on closed circuit basis containing a sump tank. The set-up consists of a Centrifugal pump coupled with a swinging frame type DC Motor which permits direct torque measurement with the help of a spring balance. Power input to the DC Motor is varied by means of a Thyristor controlled DC Drive to vary the RPM of a motor. An RPM Indicator with Proximity sensor indicates the RPM of Pump. The flow of water is measured by using a measuring tank and stop watch. 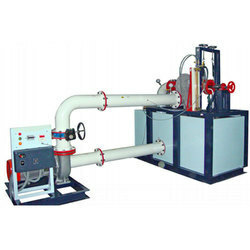 A vacuum gauge is fitted on suction line and a Pressure gauge is fitted on a delivery line to measure the pressure.Centrifugal Pump Test Rig is a self-contained unit operated on closed circuit basis containing a sump tank. The set-up consists of a Centrifugal pump coupled with a swinging frame type DC Motor which permits direct torque measurement with the help of a spring balance. Power input to the DC Motor is varied by means of a Thyristor controlled DC Drive to vary the RPM of a motor. An RPM Indicator with Proximity sensor indicates the RPM of Pump. The flow of water is measured by using the measuring tank and stop watch. A vacuum gauge is fitted on suction line and the Pressure gauge is fitted on the delivery line to measure the pressure. To determine total head, Pump Output, overall efficiency and pump efficiency of the centrifugal pump. To plot Head vs Discharge, Pump efficiency vs Discharge, Pump Output vs Discharge. 1 Self Contained “CENTRIFUGAL PUMP TEST RIG (VARIABLE SPEED WITH SWINGING FIELD DYANOMETER)” Apparatus. Drive 1 HP DC Motor with Thyristor controlled DC drive for variable speed. Sump Tank Capacity 110 Liters. Flow Measurement Capacity 70 Liters. Energy measurement L&T make, Electronic Energy meter. Power Supply 1kW, 220V AC, Single Phase. 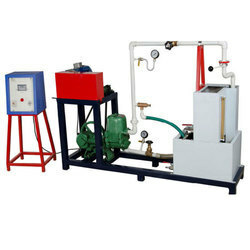 The present Centrifugal Pump Test Rig is a self-contained unit operated on closed circuit basis containing a sump tank. The set-up consists of a Centrifugal pump coupled with a DC Motor. Power input to the DC Motor is varied by means of a Thyristor controlled DC Drive to vary the RPM of the motor. An RPM Indicator with Proximity sensor indicates the RPM of Pump. The flow of water is measured by using measuring tank and stopwatch. A vacuum gauge is fitted on suction line and the Pressure gauge is fitted on the delivery line to measure the pressure. Tanks will be made of Stainless Steel. 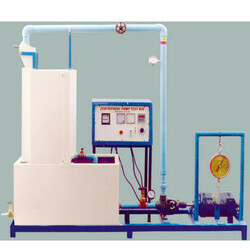 The present Centrifugal Pump Test Rig is a self-contained unit operated on closed circuit basis containing a sump tank. The set-up consists of two Centrifugal pumps. Both pumps are coupled with individual Motors. Speed Control facility is provided to vary the RPM of the motor. RPM Indicator with Proximity sensor indicates the RPM of Pump. Pipeline and valve arrangement provided enables the user to operate the test rig either in single pump operation, parallel mode or in series mode. The flow of water is measured by using measuring tank and stopwatch. Vacuum & Pressure gauges are fitted on suction line and delivery line of each pump to measure the pressure. Efficiency curves at various speed and heads. RPM measurement: RPM Indicator with a Proximity sensor. Energy measurement: L&T make electronic energy meter. 1 Self Contained "Centrifugal Pump Test Rig (Multi Stage, Variable Speed, Series & Parallel)' Apparatus. 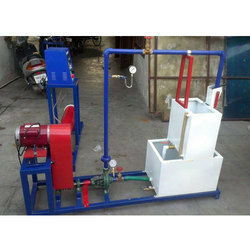 The present Gear Pump Test Rig ( Variable Speed With Swinging Field Dynamometer) is a self-contained unit operated on closed circuit basis containing a sump tank. The set-up consists of a Gear Pump having a pair of meshed gears, coupled with a DC Motor. Power input to the DC Motor is varied by means of a Thyristor controlled DC Drive to vary the RPM of motor. A RPM Indicator with Proximity sensor indicates the RPM of Pump. Flow of fluid is measured by using measuring tank and stop watch. 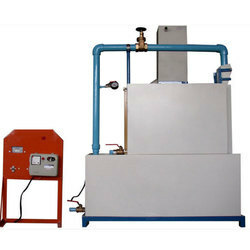 Vacuum gauge is fitted on suction line and Pressure gauge is fitted on delivery line to measure the pressure. To determine total head, pump output, overall efficiency and pump efficiency. To plot Graph: Head vs Discharge Pump efficiency vs Discharge. Water Circulation FHP Pump, Crompton make. Sump Tank Capacity 140 Liters. Owing to our expertise and the assistance of dedicated workforce, we have been able to offer optimum quality Hydraulic Ram Test Rig at an affordable market price. These products are precisely manufactured under strict supervision using best quality metal. Known for unmatched quality, high efficiency and hassle-free operations, these products are highly demanded among the industrial clients. Hydraulic Ram is used for pumping a small quantity of water at the high head when a large quantity of water at the small head is available. It operates on the principle that if flowing water is suddenly brought to rest in a long pipe, a phenomena known as water hammer occurs, wherein a pressure wave travels along the pipe. This principle is used in the Hydraulic Ram to pump water. The set-up consists of a box incorporating pulse and non-return valves and a supply reservoir on a stand which is fed by the overhead tank. An air vessel above the valve chamber smoothes cyclic fluctuations from the Ram delivery. Different pressure may be applied to the pulse valve to change the closing pressure and hence the operating characteristic. RPM measurement Digital RPM Indicator with Proximity sensor. Sump Tank Capacity 65 Ltrs. 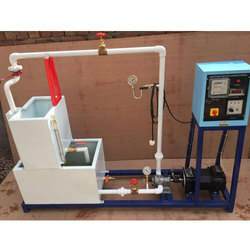 The present Reciprocating Pump Test Rig is a self-contained unit operated on closed circuit basis containing a sump tank. The set-up consists of a Double acting, Single Cylinder Reciprocating Pump coupled with a DC Motor Power input to the DC Motor is varied by means of a Thyristor controlled DC Drive to vary the RPM of a motor. An RPM Indicator with Proximity sensor indicates the RPM of Pump. The flow of water is measured by using a measuring tank and stop watch. A vacuum gauge is fitted on suction line and a Pressure gauge is fitted on the delivery line to measure the pressure. To determine total head, overall efficiency, pump efficiency and volumetric efficiency of the reciprocating pump. Energy measurement Energy meter Electronic, L&T make. 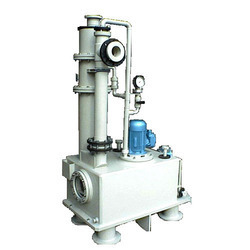 We are offering a wide range of Submersible Pump Test Rig. The present Submersible Pump Test Rig is a self-contained unit operated on closed circuit basis containing a sump tank. The set-up consists of a Submersible Pump, which is mounted horizontally with sump tank. The flow of fluid is measured by using the measuring tank and stop watch. To determine total head, pump output, overall efficiency and pump efficiency of the submersible pump. To plot Graph Head vs Discharge Pump efficiency vs Discharge Pump HP vs Discharge. We are offering a wide range of Kaplan Turbine Test Rig. Highly acknowledged for its corrosion resistance, shock proof body construction and hassle-free operation, offered equipment is extensively demanded among our huge client base. We are counted among the most prominent manufacturers, traders and exporters of premium quality Francis Turbine Test Rig. Our professionals manufacture this apparatus in compliance with the industry laid parameters, using good quality raw materials. This apparatus undergoes several stages of quality checks to ensure of the best quality. Appreciated for sturdy construction, optimum water circulation and cost-effectiveness, this apparatus is highly demanded around the globe. Francis Turbine is a reaction turbine, which was developed by an English born American Engineer Sir J. B. Francis. The water enters the turbine through the outer periphery of the runner in the radial direction and leaves the runner in an axial direction and hence it is called a mixed flow turbine. As the water flows to the runner, a part of pressure energy goes on changing into kinetic energy. Thus the water through the runner is under pressure. The runner is completely enclosed in an air tight casing and the casing & runner is always full of water. The present set-up consists of a runner. The water is fed to the turbine by means of Centrifugal Pump, radially to the runner. The runner is directly mounted on one end of a central SS shaft and another end is connected to a brake arrangement. The circular window of the turbine casing is provided with a transparent acrylic sheet for observation of flow on to the runner. This runner assembly is supported by thick cast iron pedestal.The load is applied to the turbine with the help of brake arrangement so that the efficiency of the turbine can be calculated. A draught tube is fitted on the outlet of the turbine. The set-up is complete with guide mechanism. Pressure and Vacuum gauges are fitted at the inlet and outlet of the turbine to measure the total supply head on the turbine. To study the operation of a Francis Turbine. To determine the Output Power of Francis Turbine. Water Circulation: Centrifugal Pump, Standard Make, Capacity 5 HP Three Phase. We are offering a wide range of Pressure Flow Packed Bed. This equipment is highly appreciated among our customer for their flawless design, hassle free installation and easy maintenance. The equipment offered by us is equipped with a rotameter and a manometer for the flow and drop measurement of water respectively. 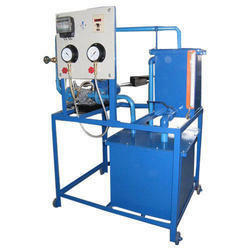 Looking for “Fluid Machinery Lab Equipments”?